On Monday, September 17, 2018, Dr. Morgan Murray, NJPA President-Elect, Dr. Alan Lee, NJPA Member-at-Large, and I met in Trenton with Jon Bombardieri, NJPA’s Government Affairs Agent. As a group, we explored the State House, discussed the New Jersey legislative process, and observed a committee meeting with testimony. We were able to meet Assemblyman Daniel Benson (D-14) and Assemblyman Andrew Zwicker ((D-16). We would like to create more opportunities for NJPA to meet with them and other legislators to discuss best ways to support quality mental health care in the state of New Jersey. We began discussions about a potential NJPA hosted advocacy day at the State House and a gathering at our Government Affairs Agent’s office for legislators. Equally as important, we discussed the best way to incorporate legislators into our 2019 Mental Health Awareness efforts and building and maintaining a grassroots network of psychologists in each New Jersey district to respond to requests for grassroots action in a timely fashion. 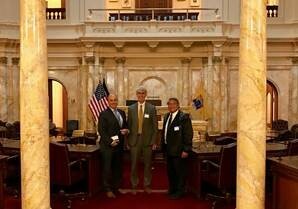 NJPA will host more NJPA Trenton field trips to ensure that NJPA and psychologists are visable in Trenton. 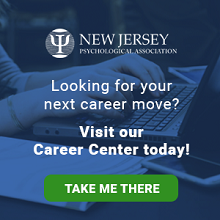 NJPA continues to work on important professional issues that impact our members, psychology, and psychologists. Below are some current topics were are working on via the NJPA executive board and various NJPA Committees. Network Adequacy: NJPA is researching the Department of Banking and Insurance regulations governing insurance and network adequacy. NJPA is committed to strengthening our political outreach and advocating for the interests of NJ psychologists and mental health issues that are important to the public. Over the years, our advocacy took many forms. Through our Committee on Legislative Affairs (COLA) and our Governmental Affairs Agent (GAA), NJPA was instrumental in maintaining standards of psychology practice in NJ, protecting patients rights, and supporting public policy. NJPA also monitors State Rules and Laws that regulate the profession, and maintains a liaison with the NJ Board of Psychological Examiners so we are always informed about any changes that may affect our members. As an affiliate of APA, NJPA is also involved in federal advocacy initiatives and regularly lobbies for federal issues that affect psychology. The NJPA Executive Board approved an endorsement of the American Psychological Association's/American Psychological Association Practice Organization’s letter of opposition to the American Health Care Act, that was recently approved by the House Energy and Commerce Committee and the House Ways and Means Committee and the Budget Committee. Read our press release here. Read about our successful changes to NJ laws affecting psychologists!